The Sumatran rhino is the smallest of all the rhino species. It is probably the closest species of modern rhino species to the ancient wooly rhino, and shares many of the same characteristics as its ancestor. Sumatran rhinos are critically endangered, meaning that they are very nearly extinct. Many rhino conservation societies specifically focus on the Sumatran subspecies. By increasing our universal knowledge of these fantastic creatures, we can increase interest in their conservation and repopulation, and hopefully help the rhinos come back in full force in their natural habitats. Sumatran rhinos are the smallest species of rhinoceros. What it loses in height, it makes up for in bulwark, weighing in at about five-hundred to eight-hundred kilograms. At shoulder height, they stand just short of 1.45 meters tall, and are about 2.50 meters long. While they are shorter than most other rhinos, their outer skin is much tougher and rough, and they can easily shrug off certain predatory advances. This rhino’s skin is a unique brown-gray color. In the wild, these rhinoceroses have short, bristly hair. The Sumatran has more hair than any other species of rhino. In captivity it can even grow out to become a shaggy mane, making the parallel to the ancestral wooly rhino evident. The shaggiest parts of this rhino’s body are behind its ears and at the tip of its tail. 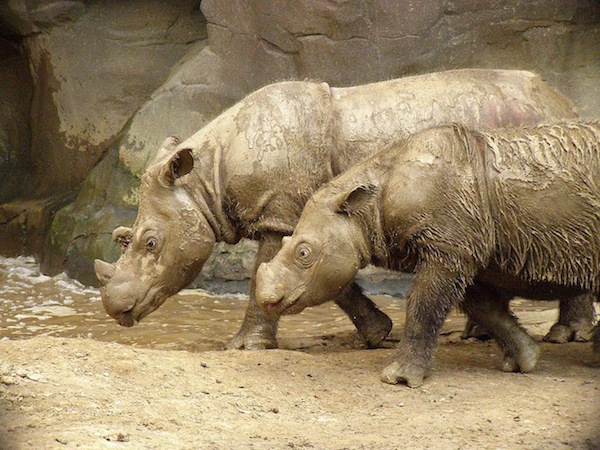 The other important distinction in appearance, are the Sumatran rhinos’ two skin folds. They are located around the shoulders and the hips, and are thicker than most rhino flesh. This skin helps protect the rhino from abrasive wounding caused by the rough plant life in its region, and certain mating rituals. Their legs are also heavily protected, to help them travel up mountainous regions unimpeded. 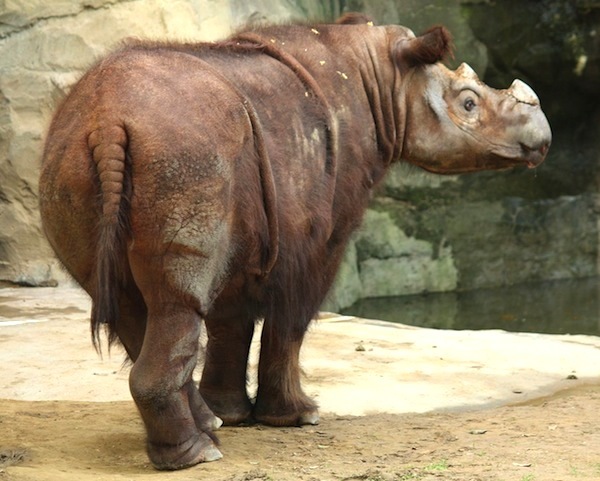 Sumatran rhinos also have two horns, classifying them as dicerorhinus. The front horn is much more prominent than the secondary horn right behind it on the snout. These horns are not designed for combat in any fashion, but for shifting mud into wallows to cool the rhino off. The horns are a dark grey color, sometimes shading as light as an off white color. The front horn can be as large as twenty-five centimeters, the second maximizing at only four or six centimeters. These rhinos are known to frequent both the lowland and highland portions of Southeast Asia. They search for food rich areas to create their dens, but often move quite a bit during the changing of the seasons, to look for areas that still have dense shrub and grass. They have been seen in Sumatra, China, Indonesia, Cambodia, India, and Borneo. The Sumatran rhino is very well suited to the dense foliage found in these regions. Like most rhinos, the Sumatran is a solitary creature. The only rhino that travels in a group is a female that is currently protecting calves. Males hold large territories; though do not seem to be aggressive about holding it. The only indications of territorial bounds are urine and feces delineating the bounds where they often roam. The most common sign of rhino territorial bounds are the distinctive hind leg scrape they often leave as a visual indication. Males territories may even overlap each other, which is considered strange, as most other rhinos guard their areas fairly ruthlessly. The Sumatran rhino is surprisingly vocal. They communicate often in grunts and whistle, though the meaning of these sounds is currently unknown. Like many other rhinos, the Sumatran also will eliminate near a large dung mound, contributing to large dung piles. They often scrape this dung into nearby bushes like the javan rhino. Scientist speculates that the large trails left behind by rhinos and elephants are actually makeshift roadways, used to delineate between feeding, mating, and salt lick locations. These trails are often marked by scrapings, urine, broken foliage, and feces. Other animals often use these trails for easy and fast movement, with protection from these larger animals. The Sumatran rhinos’ feeding habits are known as “browser” feeding. This means that it often eats the richest or tastiest of the available food sources nearby. They are most often seen eating saplings, the tops of grass, and crowns of trees that the rhinos have pulled down. Their most common diet consists of the remains of landslides, like trees that have been broken and destroyed. Fruit is also a mainstay of the rhino. The Sumatran can ingest up to sixty kilograms of organic plant matter daily. This rhinos’ upper lip is also prehensile, allowing it to grab at fruit and leaves and pull them down. The rhino masticates its food with two rows of crown shaped molars, which wear down into disc shapes as the creature grows older. Most Sumatran rhinos die of undernourishment when they can no longer chew their food properly. Their bottom teeth are sharp, almost dagger-like, and are their primary defensive device. Sumatran rhinos digest their food via their large colons and stomachs. Food that would be otherwise indigestible is broken down by microorganisms in their hindgut fermentation systems. Salt licks are important to the creation and maintenance of these microorganisms, as with many other digestive systems. Female Sumatran rhinos reach sexual maturity at about four years of age, the males becoming sexually active around seven years of age. A female rhino can produce offspring once every four to five years, making it one of the slowest mammalian reproductive cycles. This slow rate of reproduction accounts for some of the reason it is endangered. A calf weans for about fifteen months, and may stay with the mother for up to two years. It is not presently known what exactly is involved in Sumatran rhino mating practices, as they have not been observed during the process. It is assumed that the reproductive cycle occurs somewhere between May and October, the rainy season. The highest level of fertility occurs in the females for only twenty-four hours a year.